Each Sunday evening it is tradition at my house to cook a really good meal. I was not going to elude that task, but this gorgeous weather outside did not give me the envy to stay indoors for hours to cook our Sunday meal. I was going to grill. That would cut down on preparation time as well as clean-up. I had seen those gorgeous jumbo shrimps at the fresh market, and still had a mango left in my fridge so I thought it would be nice to pair the two. Ingredients for 2 : 5 jumbo shrimps per person ( so 10 jumbo), 1/2 of ripe but firm mango peeled and diced, 1 tbsp of chopped fresh mint, 1 garlic clove crushed, 1 tbsp of grated fresh ginger, 1 tbsp of sherry wine, 1 tbsp of brown sugar, 1/2 tsp of yellow curry, salt and pepper to taste, 1 tbsp of olive oil. Peel and deveine the shrimps, but make sure to keep the end tail. Set aside. In a medium size bowl, mix all the ingredients above and mix well. 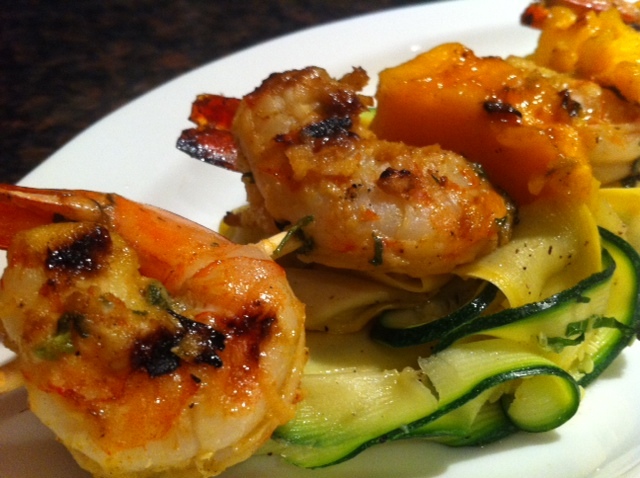 Add the shrimps and the mango to the marinade, and mix well to coat the shrimps and mango. Let marinade for 10-15 minutes. 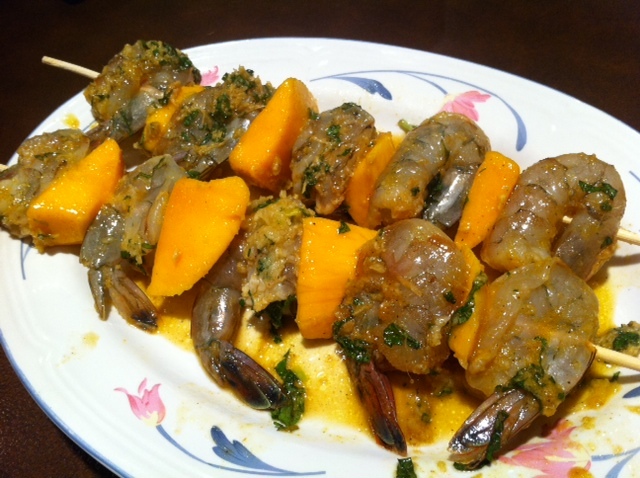 Then thread 5 shrimps, and 4 mango pieces onto the skewers. Cook the kebabs on a hot grill for 3-5 minutes, make sure to turn them at least one. The shrimps should be pink. 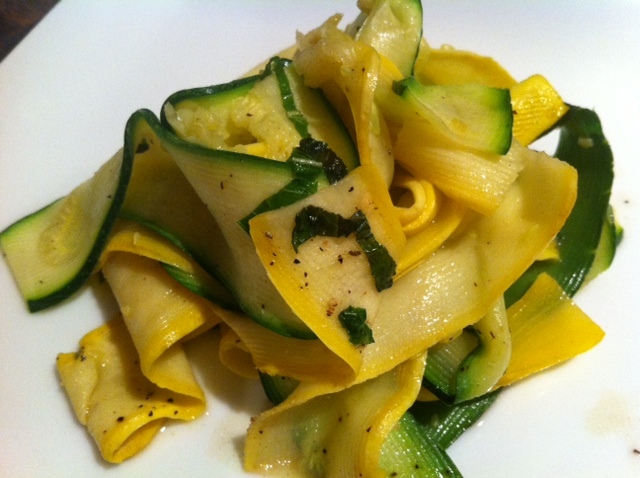 Zucchini and Squash Tagliatelle: 2 small zucchini and 2 small yellow squash, 1 tbsp of butter, 1 tsp of fresh mint, salt and pepper to taste. 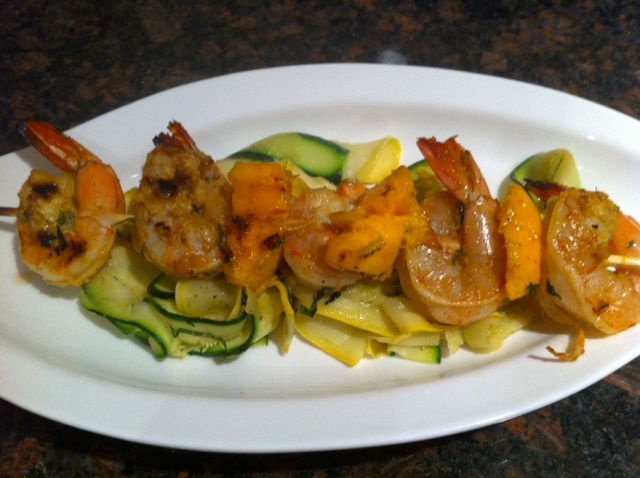 With a vegetable peeler, slice the zucchinis and the squash into thin long strips. Place them in the large round flexiform, top with the octogonal silpat and microwave for 2 minutes. Once the vegetables are cooked, turn the stove to medium heat, and place 1 tbsp of butter in a frying pan. When the butter is starting to sizzle, drop the vegetables, and quickly stir them. Season with salt and pepper and add the chopped mint.